Shortly after the inauguration of Trump as president of the US, this country has entered a new “post-truth” era. The president, who undoubtedly has serious (and perhaps justifiable) feelings of inferiority and insecurity along with his narcissism–despite outward posturing–claimed that his inauguration crowd size was larger than that of Obama or of any US president in history. Does inauguration crowd size matter, one way or another? Actually, who really cares? But perpetration of the lie–and this is a man who lies as easily as he breathes–DOES MATTER. Particularly when there is ample proof that this is a lie. 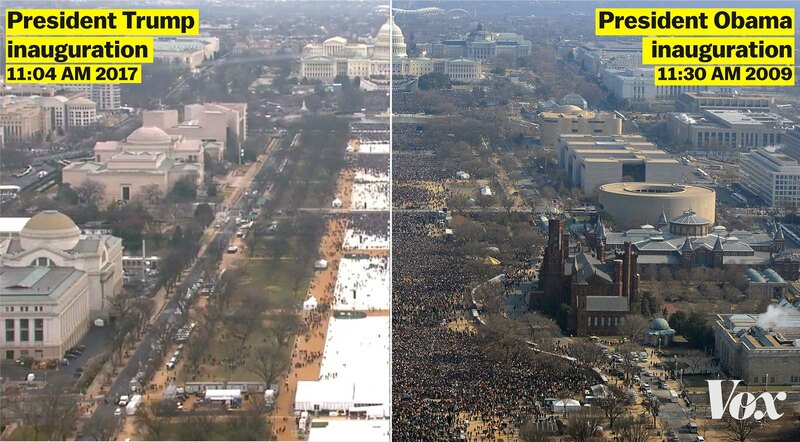 The image above and the ones below, taken at almost the same hour on Inauguration Day for Obama in 2009 and Trump in 2017 make this abundantly clear. 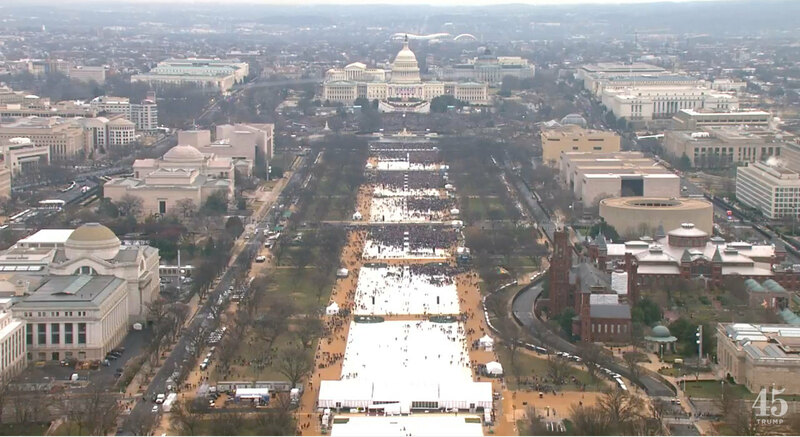 However, the president sent out his advisers and press people to perpetuate the false claim that more people attended his inauguration. Former White House press secretary Sean Spicer stood in front of a room full of journalists and told them, and the American people–and the world–that they are wrong and that the president was right. He stated the bald-faced lie (with obvious irritation at being asked about the issue) that it was the largest inauguration ever. Period. Those were his words before ducking out and refusing to answer questions about the telling aerial images and photos that proved he was wrong. Later, Trump’s mendacious mouthpiece, Kellyanne Conway, repeated the lies and coined a new term which will, I predict, have long-range damaging effects on American society. When pressed about the issue by Chuck Todd of “Meet the Press,” she told the American public that “You’re saying it’s a falsehood. And they’re giving — Sean Spicer, our press secretary — gave alternative facts,” she said. His answer, of course was: “Alternative facts aren’t facts, they are falsehoods.” The new ‘post-truth era,’where ‘alternative facts‘ become an accepted answer when pressed about prevarication, has ramifications that go beyond politics. After all, if we can casually brush off lies and call them alternative facts regarding day to day events, why not in science? Take the following potential situation, for example: my colleagues in the lab and I recently discovered that a protein influences mitochondrial fission. This means that in the absence of this protein, the mitochondria in cells are not cleaved and trimmed, but tend to become very long and elaborate. 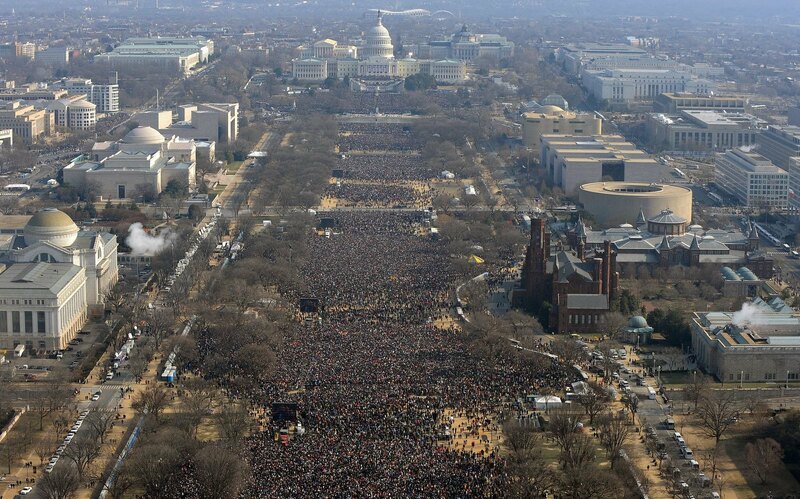 Just as the inauguration of President Obama was large. 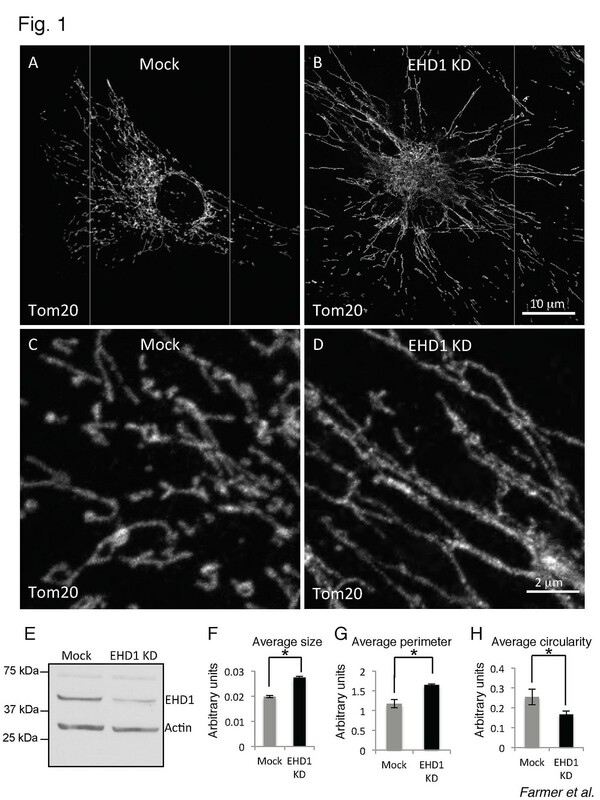 The length of mitochondria increases when the protein EHD1 isn’t there… We recently published our findings, and this first figure from the paper shows that a protein called EHD1, when deleted from cells genetically (the right-hand images) leads to elongated mitochondria (the white structures marked by the protein Tom20). As one can see from the graphs in F, G and H of the figure, we have quantified mitochondria from hundreds of cells, and this is not merely an atypical set of images but images that are representative of what is really going on. Humorous? Satirical? Highly unlikely? So was the election of our current president. Scientists, beware. You have been warned. This entry was posted in research, science and tagged alternative facts, inauguration, kellyanne conway, liar, lies, m, mendacious, mitochondria, narcissistic personality disorder, president, president obama, science, sean spicer, Trump. Bookmark the permalink.